Over the last 15 years that I’ve been in the workplace, I’ve worked in a variety of organisations. One thing I’ve found is that those that are poor at change management are sub-standard in other ways. That makes sense, of course, because life = change. There’s a whole host of ways to understand change within organisations. Some people seem to think that applying the same template everywhere leads to good outcomes. They’re often management consultants. Others think that every context is so different that you just have to go with your gut. I’m of the opinion that there are heuristics we can use to make our lives easier. Yes, every situation and every organisation is different, but that doesn’t mean we can’t apply some rules of thumb. That’s why I like this ‘Managing Complex Change Model’ from Lippitt (1987), which I discovered by going down a rabbithole on a blog post from Tom Critchlow to a blog called ‘Intense Minimalism’. Confusion → lack of Vision: note that this can be a proper lack of vision, or the lack of understanding of that vision, often due to poor communication and syncrhonization [sic] of the people involved. Anxiety → lack of Skills: this means that the people involved need to have the ability to do the transformation itself and even more importantly to be skilled enough to thrive once the transformation is completed. Resistance → lack of Incentives: incentives are important as people tend to have a big inertia to change, not just for fear generated by the unknown, but also because changing takes energy and as such there needs to be a way to offset that effort. Frustration → lack of Resources: sometimes change requires very little in terms of practical resources, but a lot in terms of time of the individuals involved (i.e. to learn a new way to do things), lacking resources will make progress very slow and it’s very frustrating to see that everything is aligned and ready, but doesn’t progress. False Starts → lack of Action Plan: action plans don’t have to be too complicated, as small transformative changes can be done with little structure, yet, structure has to be there. For example it’s very useful to have one person to lead the charge, and everyone else agreeing they are the right person to make things happen. I’d perhaps use different words, as anxiety can be cause by a lot more than not having the skills within your team. 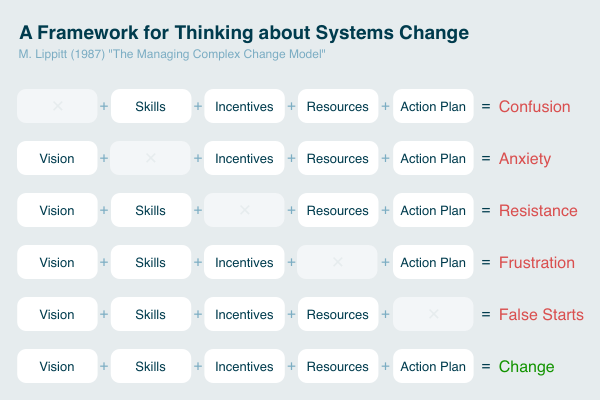 But, otherwise, I think it’s a solid overview and good reminder of the fundamental building blocks to system change.